1 At that time the Roman emperor, Augustus, decreed that a census should be taken throughout the Roman Empire. 2 (This was the first census taken when Quirinius was governor of Syria.) 3 All returned to their own ancestral towns to register for this census. 4 And because Joseph was a descendant of King David, he had to go to Bethlehem in Judea, David’s ancient home. He travelled there from the village of Nazareth in Galilee. 5 He took with him Mary, his fiancée, who was now obviously pregnant. I have set this scene in early afternoon. The sun is on the left (west) of this scene. Various relatives or fellow travellers. 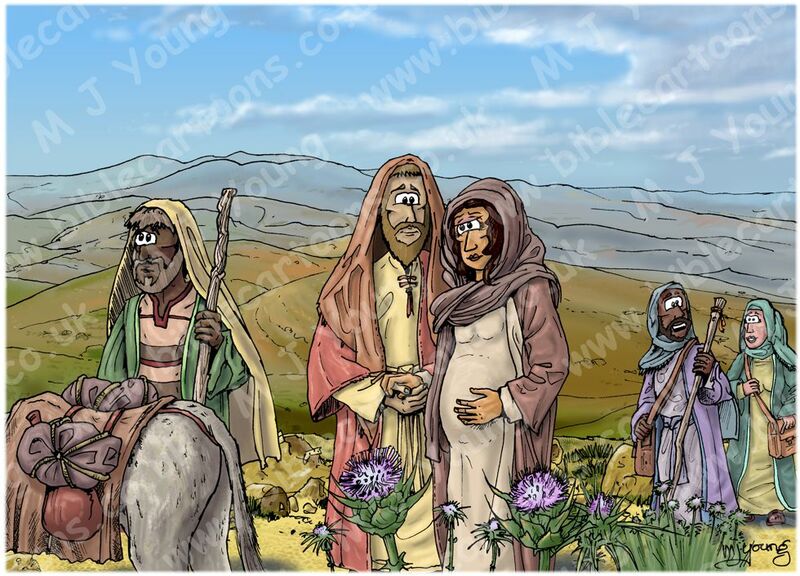 This is the second of the WALKING versions, showing Mary (with Joseph) walking to Bethlehem, with light, daytime sky & lighter bakground hills behind. On the next 2 pages can be seen the RIDING versions, which show the more typical scene: Mary riding on a donkey. Some commentators have suggested that Mary may have walked rather than ridden (as is more traditionally depicted in Nativity scenes), as the jostling & jolting caused by riding the donkey might have been harmful to the baby inside her. This scene shows Joseph & Mary resting briefly as various relatives &/or fellow travellers move along the track. The scene is set in the Jordan valley, with the hills of Samaria in the background. I found photo reference for the hills on the internet, which form the basis of my own design. The location of this scene is in Israel, along the Jordan river valley, which runs north-south from Lake Kinneret (aka the sea of Galilee) in northern Israel to the Salt Sea (aka The Dead Sea) in the south. Nazareth (where Joseph & Mary’s started from) is 32 miles (51.5 km) NW, as the crow flies. Bethlehem (Joseph & Mary’s destination) is 47 miles (76 km) SW, as the crow flies. The scene is set approximately 16 miles (11 km) SSE of Mount Gilboa (Where King Saul died (see 1 Samuel 28:4; 1 Samuel 31:1, 8; 1 Chron. 10:1)). 17.5 miles (28 km) ENE of Shechem. 27.5 miles (44 km) due South of Lake Kinneret. 38 miles (61 km) North of The Salt Sea. “The Jordan Valley area, also known as Ghor Al-Ordon, extends along approximately 124 miles (200 km) from Lake Tiberias to the Dead Sea, the floor of the valley, flanking both sides of the Jordan River. It hosts an enormous range of habitats, from subtropical Sudanian in the north to extremely arid Sudanian habitat in the south. As the above description of this relatively small tract of land indicates, there is wide variation in climate types & vegetation in this region. My scene is set within the Middle Jordan Valley climatic region. I have chosen to show Silybum marianum (Holy Thistle)*1 in the foreground, which is a suitable plant for this climatic zone type. 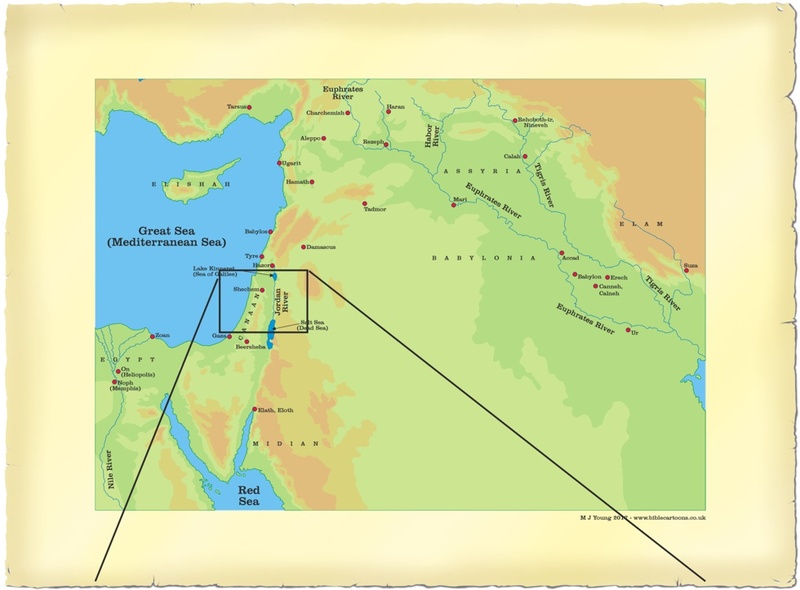 Description of possible route(s) taken by Joseph & Mary. 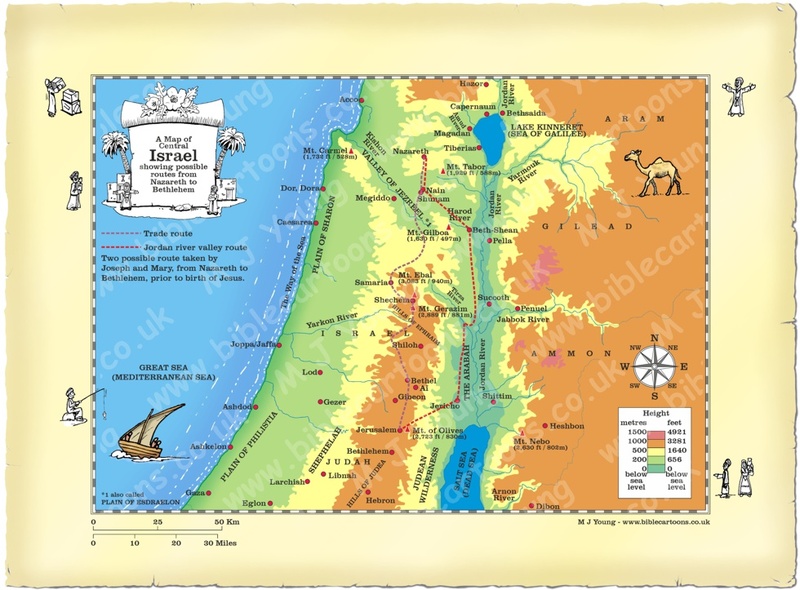 Over 2000 years ago, Joseph & Mary made the journey from Nazareth in Galilee (northern Israel) to Bethlehem, their ancestral “home town”, a few miles south of Jerusalem (West of the Dead Sea). Because of the threat of bandits on the roads, it is quite likely the couple travelled with a caravan of other travellers, for mutual support & safety. There could have been other people returning to Bethlehem (& other central & southern villages, towns, cities) for the census. Route 01) The Trade Route – marked with a purple dashed line on my map (see below). Route 02) The Jordan River Valley Route – marked with a red dashed line on my map (see below). Route 01 is shorter (approximately 80 miles (129 km), but the walk would have been more demanding, since it traverses hills in Samaria (in central Israel). There is also the “social landscape” to take into account – in that the Jews hated the Samaritans, & the other route (what I’ve called the Jordan River Valley Route) allowed Jews to circumvent Samaria altogether. The Trade Route would also have exposed the travellers to more arid conditions, due to the elevation of their surroundings. Route 02 is the flatter way, running as it does through the Jezreel valley into the Jordan River Valley, which would have been easier going for the pregnant Mary. This route is longer, being approximately 90 miles (145 km) in length, but the climate in the valleys would have been more comfortable than the arid hills of Samaria. Joseph, Mary & any others who travelled with them would still have been obliged to make the steep 16 mile (26 km) climb up the road from the Jordan valley near Jericho to the heights on which Jerusalem rests. In Jesus’ time, this section of the road was called “the Way of Blood”, because of the danger from robbers. Incidentally, this section of road is where Jesus’ parable of the Good Samaritan is set. It ascends 3,500 feet over 16 miles, which makes for quite a steep gradient. 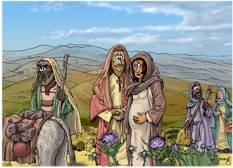 Travelling at about 10 miles per day, it would have taken Joseph & Mary about 8-10 days to reach their destination. Regardless of the route, the journey would have been quite arduous & was probably a scary prospect for the young, pregnant mother. A note about the Jericho-Jerusalem road. 01) 2 Kings 25:4 – King Zedekiah’s thwarted attempt to escape the Babylonians. 02) Mark 10:46-11:1 – The account of Jesus healing the blind beggar Bartimaeus.